Apologies for the lag in updates; everyone on Project SNOWstorm does this in their spare time, and sometimes spare time is hard to come by. I was out of town and largely off the grid last week, and unable to post. Sorry to have kept you waiting. Unfortunately, the biggest news is the saddest — we’ve lost another owl, our fourth of the season. Manisses, our first Rhode Island snowy tagged on Valentine’s Day, was found dead Saturday morning, St. Patrick’s Day, on Block Island, where she’s been all winter. She’ll be examined by our veterinary team, which will conduct a full toxicology screen and look for signs of disease or other health issues, and we’ll get back to you with the results. Ironically, the vets had just finished a large batch of necropsies on salvaged owls from across the Northeast this winter, including Hereford, our tagged owl that died at the beginning of the month in New Jersey, very close to where Higbee was killed by a vehicle in January. The necropsy confirmed that Hereford, too, suffered impact injuries, most likely from a vehicle. Owls and cars don’t mix safely. Most of the other owls remain on their winter territories. Exceptions include Ashtabula in North Dakota, who has meandered more than 160 miles (260 km) to the north and west in recent weeks, and as of Monday evening was only a few miles from Pettibone in western Stutsman County. In Wisconsin, Arlington — who had made a big move to the west in early March — has since stuck close to his new spot near Alma Center in Jackson County. And Bancroft, one of the trio of tagged birds on the Buena Vista grasslands in central Wisconsin, has lately been pushing back into his old territory, from which he had initially been evicted by Straubel, a larger female. Their tracks for the past week show a lot of overlap in space, if not in time. Neighboring young male Austin, though, seems mostly to keep out of Straubel’s way. Island Beach has been moving frequently back and forth across the mouth of Delaware Bay, between Cape May, NJ, and Cape Henlopen/Lewes, DE, where he was at the beginning of the week. His transmitter has been struggling all winter, possibly because he keeps the solar panel buried in feathers, so the data we get from him is more sporadic than most. We’ve tried several times to retrap him and swap a different style of transmitter, but he was having none of it. Island Beach’s fellow New Jersey-tagged owl, Lenape, continues his unprecedented wanderings along the mid-Atlantic coast — Lenape is the most peripatetic owl we’ve ever tagged. 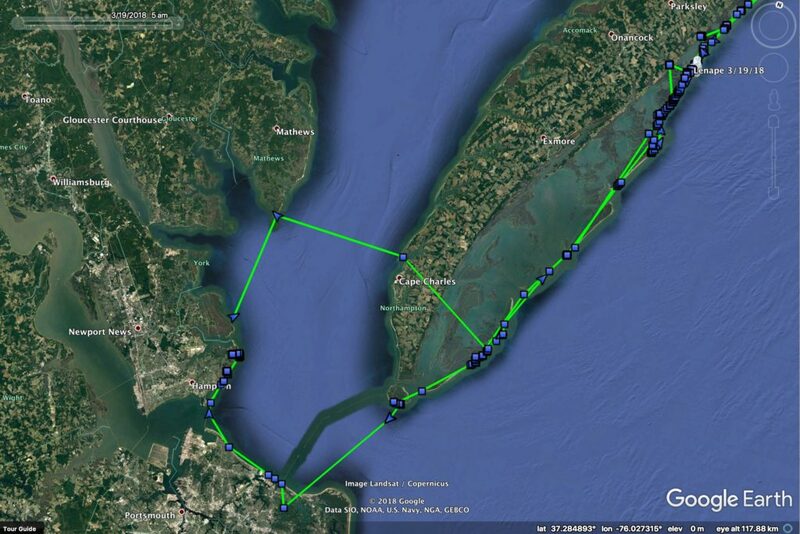 Having crossed the mouth of the Chesapeake Bay in Virginia earlier this month, this young male soon flew 14 miles (22.5 km) back across the bay to the Eastern Shore, and has remained on the complex of rich, remote barrier islands that rim the Atlantic south of Chincoteague. On Lake Ontario, the fast-disappearing lake ice has finally forced Stella completely to land on Amherst Island, ON — no more spending her days well offshore and only coming in to hunt. Likewise, Hilton has come off Lake Erie after several months mostly on the ice, and this week she’s been hanging out at Gull Point in Presque Isle State Park near Erie, PA — the most reliable spot in the Keystone State for snowies. Since part of the peninsula was cut off by storms, the point is difficult for humans to access, which doubtless enhances its appeal. In Michigan, Sterling remains near Holland, but like Island Beach his transmitter isn’t getting much sun, and hence we’re not getting a great data stream. Help Us Head to the Arctic This Summer! I believe we saw a snowy owl in our meadow in Stormstown, Centre County PA. Certainly could be — there have been several sighted this winter in central Pennsylvania, including Centre County. Several snowies have been found dead. Two recently in a NWR. Both were sent out for testing. Glad to hear the dead owls will be necropsied and tested. We’ll have a roundup at the end of the season from our veterinary team (which is cooperating with similar experts across the country) on what they’ve been finding in terms of snowy owl health. I picked up a deceased Snowy off interstate 75 in Ohio about a month ago and turned him into Black Swamp Bird Observatory. Its so sad so many get hit by cars. It’s a sad truth that, even more than most raptors, snowies are at risk from vehicle collisions because they lack any innate fear of humans or experience with our stuff. Add to that the fact that highway margins are often the best small-mammal habitat around (especially in areas with intensive agriculture or urbanization) and they can become death traps for many raptors. What the update on Chickawatabut ? She’s doing fine, remaining on her winter territory east of Louiseville, QC. The last transmission we got from her was Friday night, and will be included when CTT updates the maps in the next day or so. Saw Stella today on Amherst Island . She was really moving a lot today . I watched her for about two hours . Thanks for the report — we’ve had recent reports of up to 40 snowies on Amherst, suggesting that spring migration and late-season movements are getting underway. Emerald’s recent tracking data (which will be included in our weekly update later today) shows she’s been spending more time out on the ice on the channel, perhaps because of construction near her field, but she was back in her usual spot last evening. Do you think Bancroft and Straubel might be pair bonding? Great question! I think, however, that’s unlikely for two reasons. Although the age of first breeding in snowy owls isn’t known, most experts believe males need to be at least four years old before they attempt to mate — certainly, none of our one- the three-year-old tagged males are known to have done so, ands Bancroft hasn’t even reached his first birthday yet. The other reason is that there is no evidence that snowy owls form pair bonds on the wintering grounds — what seems more typical is that the adult males set up territories in the Arctic (often moving thousands of kilometers from one summer to the next — they are highly nomadic), perhaps based on lemming populations. They then attract a female. Nor is there any evidence that pair bonds last more than a single nesting season, unlike most large raptors that show long-term mate fidelity. I’ll be giving a talk on our West Virginia wanderer tomorrow night in Marietta, OH. Co-sponsored by Wash. Co. Public Library and Campus Martius and OH River Museums. I’m SO excited to spread the SNOWstorm gospel. Your data and a description of your amazing research forms the first third of the talk. Thank you for all you do. Sharing the SkunkBear NPR video on my Facebook wall as we speak. What a sweet piece that was! Congratulations for the great exposure. I hope you get to the Arctic this summer! Julie –Thanks for spreading the word, and thanks again for your leadership on getting the Parkersburg, WV, owl into rehab with Katie and Jesse Fallon after it was hit. So glad to know that bird went back into the wild up on Lake Erie. Saw a snowy owl in Fortescue, NJ on Easter weekend. This is the first time we ever saw a snowy owl. We took a few pictures. We found this website and figured we post the siting. Thanks, Chuck — the New Jersey coast has been great for snowies, and one of our tagged owls — Island Beach — was right in Fortescue this past weekend. We’ll be updating the maps soon with the latest data…check out his map to see if he was the bird you photographed, but I wouldn’t be surprised if he was.